MAE WEST always had a faithful secretary at her side. In her memoir "Goodness Had Nothing to Do With It," she thanked several special people. • • Mae West wrote: A book about one's life necessarily demands a tremendous amount of recollection and research, and I have never kept a diary. I once told an interviewer that if I ever kept a diary it would have to be written in invisible ink. • • Mention must be made of my dear friends and business associates, Murray Fall and James J. Geller, who finally persuaded me to set down the events of my life. • • Many of my records preserved through the years were hopelessly ruined in the storage room of my apartment building in Hollywood during the "unusual" floods of 1933—1935. My important papers, copyright cards, and family photos stored there could not be replaced. • • I am, therefore, appreciative of the assistance given me by Larry Lee, my longtime associate, in recalling to me many of the names, dates, places and events which I have recorded in this autobiography. • • I also wish to thank Criswell for the hours and days he spent in research, exploring library records and newspaper files for factual information and data concerning my life not easily obtainable otherwise. • • Of all her secretaries, Larry Lee probably worked with Mae the longest. According to Jill Watts, "Larry Lee . . . had worked for her in various capacities since 1929." • • Mae's secretary, Larry Lee gave a memorable courtroom appearance, too. On 28 August 1948, a wire service reported on this: "Scenes From Play Are Staged In Court By Mae West Aides." Apparently, Mr. Lee was quite entertaining. No wonder Mae enjoyed having him around. • • More of Mae's "official" secretaries (i.e., paid employees) will be featured in the next post. • • One more installment of the very interesting week-long article "Mae West in Roads of Romance" by Harry Lee and Winfield Meggs, Side Glances columnists and illustrators for The Winnipeg Evening Tribune, was published on Wednesday, 30 May 1934. • • On this date an article appeared: "Mae West Will Open a Casino." The plan to launch Mae West's Diamond Lil Casino Restaurant in Las Vegas was being worked on by her lawyer Charles Catt and her manager Jim Timony. • • Christie's held this auction of a Mae West movie collectible in New York City, Rockefeller Plaza on Wednesday, 30 May 2007. • • A costume design for Mae West, circa 1970s, by Edith Head possibly for "Sextette" . The sketch of this elegant pink gown is pictured in the auction booklet. A collector paid $900 to possess it. • • Unless there has been a change In plans, Mae West opens Tuesday at Veterans' Memorial Auditorium, Columbus, Ohio, in something called "Sextette." John Kenley is producing. • • Mae West said: "Love means one thing to one's parents and something else to another. lt's a more or less powerful emotion beyond ordinary human control. Try it yourself sometime and you'll get what I mean." • • A Midwest paper discussed Mae West. • • The Mae West Blog was started eleven years ago in July 2004. You are reading the 3452nd blog post. 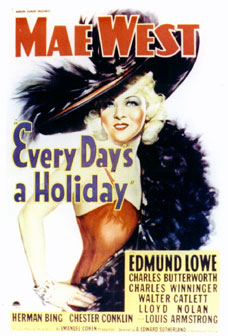 Unlike many blogs, which draw upon reprinted content from a newspaper or a magazine and/ or summaries, links, or photos, the mainstay of this blog is its fresh material focused on the life and career of Mae West, herself an American original.